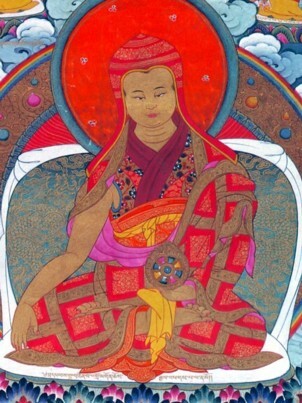 Chögyal Pakpa (Tib. ཆོས་རྒྱལ་ཕགས་པ་, Wyl. chos rgyal phags pa) (1235-1280) — the hierarch of the Sakya school who was recognized in 1253 as the ruler of Tibet by Kublai Khan (1215-1294) during the Yuan dynasty. He was also the nephew of Sakya Pandita. At the request of Kublai Khan, Chögyal Pakpa designed a new alphabet, the 'phags-pa script, which could be used as a unified script for the written languages within the Yuan Empire. Chögyal Pakpa extended the Tibetan alphabet, to encompass Mongol and Chinese. The actual use of this script was limited to about a hundred years during the Mongol Yuan dynasty, and it fell out of use with the advent of the Ming dynasty. This page was last edited on 17 January 2017, at 20:21.